For other uses, see Yorick (disambiguation). Yorick's skull in the 'gravedigger scene' (5.1), depicted by Eugène Delacroix. It is suggested that Shakespeare may have intended his audience to connect Yorick with the Elizabethan comedian Richard Tarlton, a celebrated performer of the pre-Shakespearian stage, who had died a decade or so before Hamlet was first performed. Portrait of Katheryn of Berain by Adrian van Cronenburgh c.1560. Shakespeare's 1601 poem The Phoenix and the Turtle was published in a collection dedicated to Katheryn's son, John Salusbury. 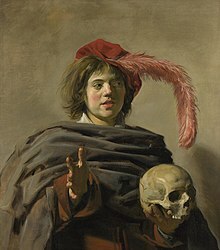 The contrast between Yorick as "a fellow of infinite jest, of most excellent fancy" and his grim remains reflects on the theme of earthly vanity: death being unavoidable, the things of this life are inconsequential. This theme of Memento mori ('Remember you shall die') is common in 16th- and 17th-century painting, appearing in art throughout Europe. Images of Mary Magdalene regularly showed her contemplating a skull. It is also a very common motif in 15th- and 16th-century British portraiture. Memento mori are also expressed in images of playful children or young men, depicted looking at a skull as a sign of the transience of life. It was also a familiar motif in emblem books and tombs. Hamlet meditating upon the skull of Yorick has become a lasting embodiment of this idea, and has been depicted by later artists as part of the vanitas tradition. The name Yorick has been interpreted as an attempt to render a Scandinavian forename: usually either "Erick" or "Jørg", a form of the name George. The name "Rorik" has also been suggested, since it appears in Saxo Grammaticus, one of Shakespeare's source texts, as the name of the queen's father. There has been no agreement about which name is most likely. Alternative suggestions include the ideas that it may be derived from the Viking name of the city of York (Jórvík), or that it is a near-anagram of the Greek word 'Kyrios' and thus a reference to the Catholic martyr Edmund Campion. The name was used by Laurence Sterne in his comic novels Tristram Shandy and A Sentimental Journey as the surname of one of the characters, a parson who is a humorous portrait of the author. Parson Yorick is supposed to be descended from Shakespeare's Yorick. The Young Lord Hamlet (1868) by Philip H. Calderon, which shows Hamlet as a child, riding on the back of Yorick. The earliest printed image of Hamlet holding Yorick's skull is a 1773 engraving by John Hall after a design by Edward Edwards in Bell's edition of Shakespeare's plays. It has since become a common subject. While Yorick normally only appears as the skull, there have been scattered portrayals of him as a living man, such as Philip Hermogenes Calderon's painting The Young Lord Hamlet (1868), which depicts him carrying the child Hamlet on his back, as if being ridden like a horse by the prince. He was portrayed by comedian Ken Dodd in a flashback during the gravedigging scene in Kenneth Branagh's 1996 film Hamlet. As a company, we all felt most privileged to be able to work the gravedigger scene with a real skull ... However, collectively as a group we agreed that as the real power of theatre lies in the complicity of illusion between actor and audience, it would be inappropriate to use a real skull during the performances, in the same way that we would not be using real blood, etc. It is possible that some of us felt a certain primitive taboo about the skull, although the gravedigger, as I recall, was all for it! David Tennant used the skull of pianist André Tchaikowsky for Yorick's skull in a 2008 Royal Shakespeare Company production. Although Tchaikowsky's skull was not used in the performances of this production, its use during rehearsals affected some interpretations and line readings: for example, Rylance delivered the line "That skull had a tongue in it, and could sing once" with especial reproach. In this production, Hamlet retained Yorick's skull throughout subsequent scenes, and it was eventually placed on a mantelpiece as a "talisman" during his final duel with Laertes. In 2008, Tchaikowsky's skull was used by David Tennant in an RSC production of Hamlet at the Courtyard Theatre, Stratford-upon-Avon. It was later announced that the skull had been replaced after it became apparent that news of the skull distracted the audience too much from the play. This was untrue however, and the skull was used as a prop throughout the run of the production after its move to London's West End. Yorick appears as a principal character in the novel The Skull of Truth by Bruce Coville. ^ Muriel Bradbrook, Shakespeare the Craftsman, London, 1969, p. 135. ^ Santana, Anaclara Castro (2 January 2015). "Yorick of Jorvik: Sophisticated Provinciality in Sterne's Tristram Shandy". ANQ: A Quarterly Journal of Short Articles, Notes and Reviews. 28 (1): 29–33. doi:10.1080/0895769X.2015.1035365. ISSN 0895-769X. ^ Alan R. Young, Hamlet and the Visual Arts, 1709-1900, University of Delaware Press, Newark, 2002, p.246. ^ a b c Ferré, David A. (2008) . "Story of the Skull". André Tchaikowsky Website. Retrieved 27 November 2008. ^ "Bequeathed skull stars in Hamlet". BBC News website. 26 November 2008. Retrieved 26 November 2008. ^ "Human skull abandoned by Hamlet". BBC News website. 3 December 2008. Retrieved 3 December 2008. ^ "David Tennant to revive partnership with real skull for BBC's Hamlet". The Daily Telegraph. 24 November 2009. Retrieved 2 December 2009. ^ Coville, Bruce (2002). The Skull of Truth. Houghton Mifflin Harcourt. ISBN 978-0152046125.